Inside Self-Storage Store. DVD - Revenue Management for Self-Storage … Are You Getting Your Share of the $32.7B? Learn how to increase your piece of the self-storage revenue pie through proven revenue-management procedures and additional revenue streams. Topics include rental rates, effective discounting and more. 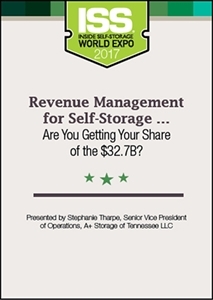 Revenue Management for Self-Storage … Are You Getting Your Share of the $32.7B?